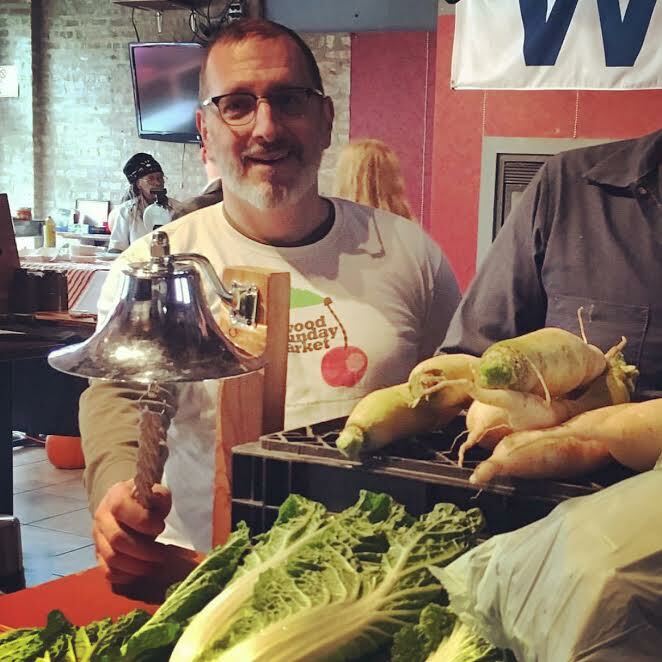 “We like to say that the entire world is encapsulated in our tiny geographic area of Chicago,” Sustainability Director & Market Director Sheree Moratto says of her Glenwood Sunday Market. In Chicago’s far northeast side, you’ll find Rogers Park, a lively neighborhood where common languages include Arabic, Bhutanese, French, Igbo, Nepali, Spanish, Tagalog and Urdu. It seems that since its 2010 community induction, ‘market’ is a shared language amongst Rogers Park residents. Glenwood Sunday Market also has cemented a fun way to drum up market volunteers. The “Become a Volunteer Speed Dating” event was conceptualized to overthrow possibilities of a boring volunteer outreach event. An open invitation called for interested volunteers over the age of 21, as the event is usually held at a bar. The market’s board identified activities needing volunteer support (finances, food access, market services, payment, education, long range planning, leadership council, junior board, fundraising, marketing, market vibrancy, etc. ), and assigned a staff member or active volunteer to represent the category at a numbered table. A market speed dating event ensues, with participants counting off to see which volunteer table they will visit first. “We ring our bell and everyone goes to their first table. They have 3 minutes to hear about each volunteer support category and ask any questions. Then we ring the bell again and they continue down the line to the next ascending number. It’s a ton of fun and completely un-boring! We’ve done the event a few times and will be doing it again this summer,” says Sheree. The bell has officially rung and Glenwood Sunday Market has taken over our Instagram account. Check out their market highlights till their bell sounds off on June 18th! Sheree Moratto: The mission of Glenwood Sunday Market is to make sustainable, regionally produced foods accessible to our whole community. Glenwood Sunday Market was founded in June, 2010 thanks to countless hours of volunteer work donated by residents of the Rogers Park neighborhood in Chicago, IL. Rogers Park is one of the most economically and ethnically diverse communities in the United States and is located on the City of Chicago’s far northeast side. Glenwood Sunday Market is a program of Rogers Park Business Alliance, a 501c3 nonprofit organization focused on economic development. The market is run by paid staff and a large circle of devoted volunteers who together make the market a beloved community experience for our shoppers and vendors. Glenwood Sunday Market has 25 vendors that are either farms or food artisans who grow and/or produce their wares within a 200 mile radius of zip code 60626. Only food and agricultural products are allowed, and we are especially committed to featuring fresh, local, sustainably grown vegetables and fruits. One of the most inspiring things about Glenwood Sunday Market is our dedication to food access for all people in our community. We accept SNAP benefits and provide a double dollar matching grant program of up to $25 per shopper per market. And thanks to our generous donors, we are launching a new food access program called Community Shares. We purchase Community Supported Agriculture Shares from our farmers and give the food away to local food pantries, soup kitchens and meal centers. Another cool thing about Glenwood Sunday Market is that we have our own wooden token currency called “Woodies” which makes shopping a breeze. They work like cash, never expire and can be purchased with credit, debit and SNAP cards. SM: Glenwood Sunday Market is an outdoor market held every Sunday from June – October from 9 a.m. – 2 p.m. on southbound Glenwood Avenue in Chicago, IL. We have occasional indoor holiday markets during the winter season, too. The market is held on a tiny, cobblestone street in the City of Chicago, IL, right next to the CTA’s Red Line Morse Ave. station and just a couple of blocks west of Lake Michigan. The market is surrounded by the elevated train, buses, public art murals, cars, bikes, people from all over the world. Glenwood Sunday Market is often described as having a European open market vibe. FMC: How has Glenwood Sunday Market changed/grown over the past 8 years? SM: In many ways Glenwood Sunday Market has changed little over the past 8 years. We have steadfastly maintained our market’s footprint, believing firmly that being bigger is not being better. We find that our 60% grower/40% food artisan and maximum of 30 stalls is a sweet spot that we aren’t going to mess with. In the early years, we concentrated on proving to our vendors and shoppers that Glenwood Sunday Market could provide a path to support our local food shed, stabilize near-to-Chicago agricultural land, help to develop our local business community, promote community vibrancy and find new ways to bring locally grown and produced food to our food insecure neighbors and friends. I think we have gone a long way toward convincing people of this and proving our impact on many of these fronts. SM: Glenwood Sunday Market wants to be the best farmers market it can be and our events, programs and activities are designed to maintain the integrity of the market while serving as a vibrant hub inspiring the development of the commercial corridor it is in. Here are a few examples of how Glenwood Sunday Market generates excitement: -Accept SNAP benefits, give matching grants of up to $25 per shopper per market -Many of our farms accept Senior Farmers Market Nutrition Vouchers and Women, Infant, Child Farmers Market Nutrition Vouchers -A Featured Vendor program, highlighting one of our farms or food artisans at each market. -A big beautiful silver bell that our Featured Vendor rings at the opening and closing of the market. -Weekly “Find the Bell” scavenger hunts for the kids (hint, it’s at the Featured Vendor’s tent!) -A non-profit partner program that provides local non-profit organizations an opportunity to table at the market. -Regular Dot Survey experiences for both adults and children – we get great information and people love sticky dots! -Monthly free bike repair sessions provided by a collaborating partner -We fundraise to buy food from our farmers and give it away to our local food pantry, soup kitchen and meal center partners -This year we are having a weekly photo contest – details are still being worked out! We also co-host a community Wine Stroll Benefit with two of our local businesses, host an annual Pro-Am Chili Cook Off and Fundraiser. And we will re-launch our “Become a Volunteer Speed Dating” event this year! SM: Glenwood Sunday Market serves a very unique community of 55,000 residents some of whom have lived in our neighborhood for decades, some who live here because they go to one of the local universities and some who come from around the world. More than 80 different languages are spoken in our neighborhood. We are very active on social media, especially Instagram, Facebook, Twitter. We use email blasts and our website to get the word out about the market. We are particularly successful with Facebook and Instagram is trending upward. In terms of printed collateral, we print postcards, posters, banners (for use on our barricades and tents), branded shopping bags and branded wooden tokens. We flyer our neighborhood twice per season – we literally print flyers and have a service provider post them on every door. This suite of printed material has been very effective for us. We print material in English, Spanish and are adding Russian, Nepali and Urdu whenever possible. We do very little paid advertising. We’ve tried print and online. Neither has had any effect, so we avoid wasting our money on this. One thing that has been very important for our ongoing success in communicating with our customers and vendors is an annual review and update of our marketing plan. We make sure we (staff, stakeholders, vendors) are all on the same page about what our story is for the season. This way, we are sure to be talking from the same point of view. We’d definitely recommend this activity for all markets. And we’d highly recommend social media as the most effective communication tool next to word of mouth. SM: Glenwood Sunday Market sprang from the heart of our community. Neighborhood volunteers spent hundreds of hours imagining, preparing and finally opening the market back in 2010. Today, the original mission and vision for Glenwood Sunday Market remains intact and now neighborhood volunteers have devoted thousands of hours to assure the market’s success. We serve tens of thousands of people each season. Our staff, stakeholders, vendors, shoppers, volunteers, parent organization, collaborators, funders, donors, sponsors, friends and neighbors believe in what the market exists to do. It’s a wonderful thing to happen anywhere. And an unexpected source of connection and pride for one neighborhood in a huge city.